Thanks to 148apps.biz we know how many apps are being submitted to the App Store. 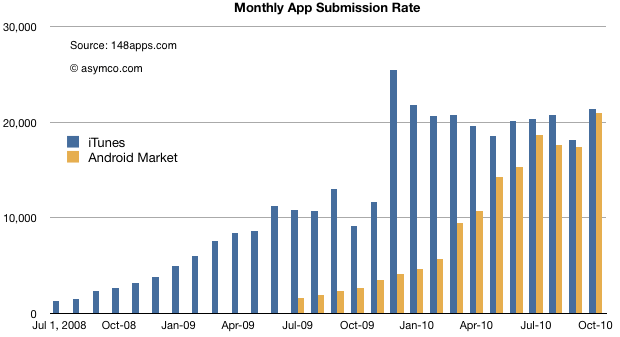 For the year so far the average has been almost exactly 20k apps per month. Toward the last half of last year, 10k/mo was the norm. 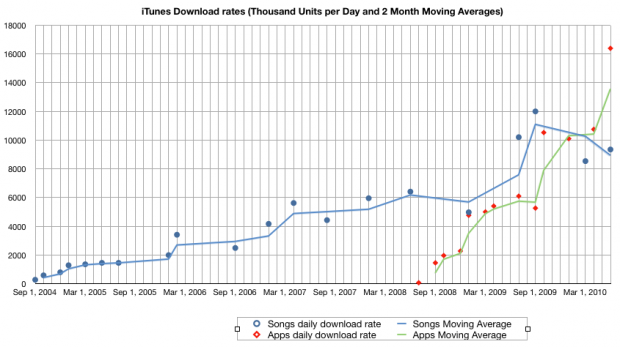 In recent articles I highlighted the acceleration in iTunes App downloads where the rate is approaching 18 million apps per day and the cumulative total apps which is about to overtake the cumulative songs downloaded. We now turn our attention now to constructing the iTunes income statement: namely total sales, gross margins and deduce its operating budget. I followed the convention of using income rate or $/month to show the history of sales. It shows that even with a price less than a third of the music product, apps are generating over half of the sales of music. In other words, apps are adding 50% to iTunes sales today. 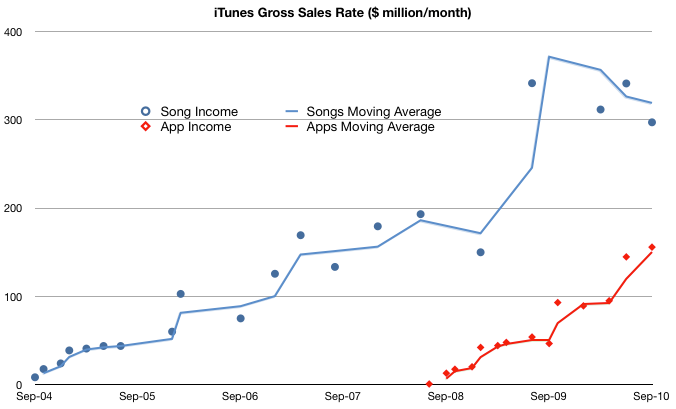 If the decline in music units continues and the app sales increase with the current trajectory then app sales value will overtake music sales next year, consistent with the cross-over of cumulative units sold. If we know how much Apple pays music licensors and developers (i.e. cost of goods sold) we can calculate how much it keeps for operations (gross margin). Apple’s app margin is 30 percent. The music margin was never official but the consensus has been 10 percent for a while. This shows that what is left after paying the content license, Apple “keeps” about $50 million every month to run the App store (iTAS) and another $30 million to run the Music store (iTMS). Apple has made a point of saying that both iTAS and iTMS are run at “break even” implying that the gross margin is used up in operating costs (CAPEX, R&D, SG&A). 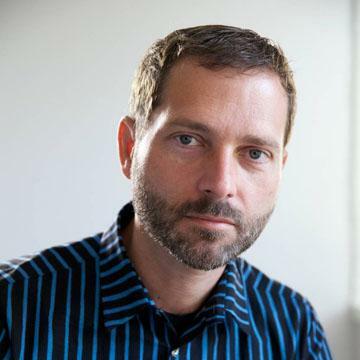 To be sure, the cost of bandwidth and the data center(s) needed must be considerable. But the operating budget for the store is beginning to reach a level that may be beyond what can be spent reasonably. The amount left over for operations has increased from ~$30 million a month in 2009 to $75 million/month today. In fact, if this burn rate is maintained (even though it’s increasing) the operating budget for iTunes is nearing $1 billion/yr. I’m not an expert on the cost of operating data centers but $ 1billion a year seems like a lot. I would love to see an analysis of how this could be allocated. 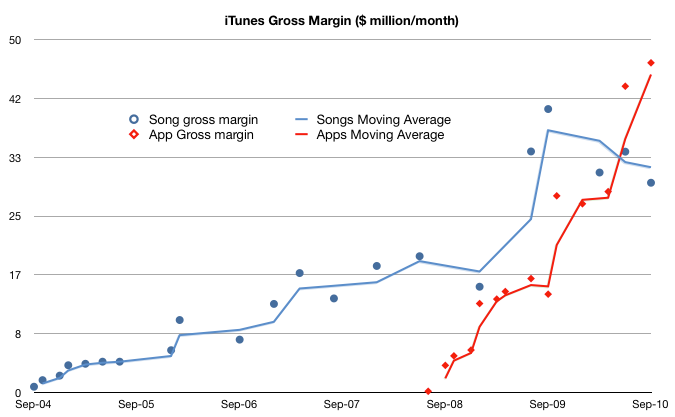 I would also add that because of the increasing mix of apps, the overall gross margin percent is increasing. I estimate that to be a blended 17%–a healthy margin for a content store–and an increase from 10% before the app store came online. Finally, one implication of the economics involved is that a budget like this may provide a significant barrier to entry for any competitors looking to take on the iTunes juggernaut. iTunes has reached content critical mass (12 million songs), user base (160 million users) and wide distribution (23 countries for songs and 80+ countries for apps). These are non-trivial operational issues that even the best in the “cloud” business models will find challenging. 450 million TV episodes downloaded implies $1 billion in sales. 35 million books adds another 500 million. Compare with 11.7 billion songs at ASP of $1 for about $12 billion in song sales and 6.5 billion apps at ASP of $0.29 or about $1.9 billion. iTMS content downloads have generated $16.4 billion in sales to date. Last week I posted the iTunes download rate graph that showed how Apps are being downloaded much more rapidly than songs and revealed an inflection point in the song rate. Based on the recent updates to iTMS and iTAS on Sept. 1, the following graph shows the cumulative units of songs and apps downloaded indexed to the same starting date. As can be seen, the App store has reached the same total downloads in 2.2 years as the iTMS reached after five years. The two curves are likely to be the same height (around 13 billion each) before the year is over. Revenue from digital sales of recorded music grew just 3.7 percent to $169 million. That’s a slower pace than the 4.5 percent growth posted a year ago and 39 percent growth two years earlier. via Warner Music CEO looks `beyond iTunes’ amid losses – Yahoo! Finance. 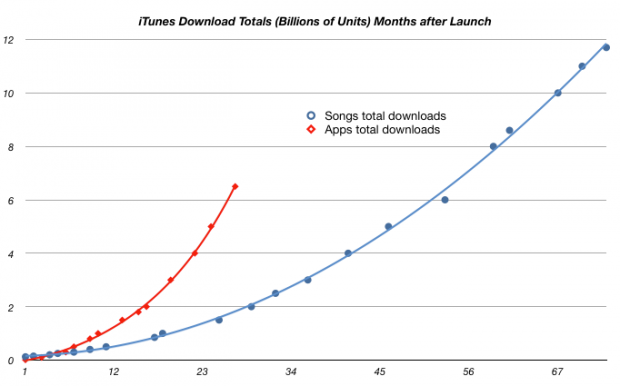 For the record, iTunes did grow at 35% in the quarter that Warner Music grew digital sales by 39% two years ago. But the two diverged a year ago with 17% iTunes vs. WMG’s 4.5% and this past quarter iTunes grew at 27% vs. 3.7%. 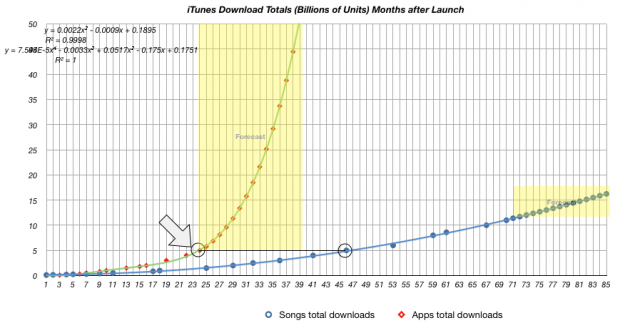 Gives us an idea of how much Apps have swelled iTunes’ top line.